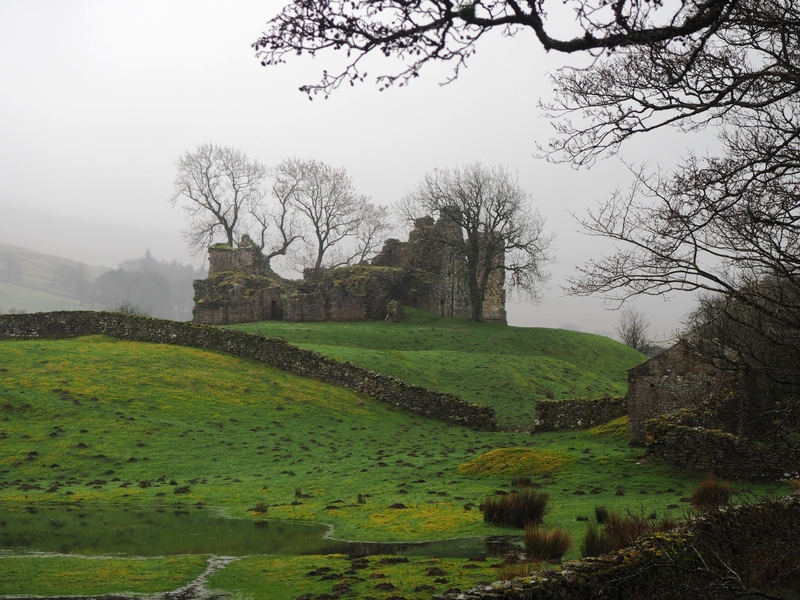 A varied walk in the Mallerstang valley visiting the ruins of two medieval castles and a return looking for waterfalls in a series of steep-sided gills. When the forecast for the weekend was cloud and rain I decided to do this lowish level walk in the Mallerstang valley. The idea was to visit some of the historical buildings in the area on the outward route as well as the top of Birkett Common. On the way back the aim was to connect the bridleway that terminates in Red Scar Gill with the public footpath that ends on Long Crag, a mile and a half to the north. I started the walk from Nateby, a mile south of Kirkby Stephen on the B6259, where I parked my car on a layby at the southern end of the village. Almost opposite the layby a footpath sign led me out of the village, across some limestone pastures and down to a bridge crossing the River Eden. On the other side of the river I walked past a gigantic alder tree and then Wharton Hall. Wharton Hall is a fortified manor house that has its origins in the 14th century. A house of more recent origin is situated right next to it and as there were signs saying ‘Private’ I stayed on the bridleway and so was unable to explore further. Continuing south following a bridleway I soon reached my next objective, the rather meagre remains of Lammerside Castle. ‘Castle’ is perhaps too grand a description for what was originally a 12th century building that was fortified as a pele tower in the 14th century as a defense against raiding Scots. From Lammerside Castle I crossed another field to reach a track below Croop House. Ignoring the house and its barking dogs I turned left on the track to contour below Birkett Common. After a third of a mile I made a detour to Round Hill on the left to go in search of the Pillow Mounds marked on the map. Pillow Mounds are artificial rabbit warrens that were constructed in medieval times. Due to there distinctive appearance they used to be thought as burial mounds and indeed the ones on Birkett Common used to be called the ‘Giants Graves’. Back on the track I continued south just a short way before making another detour, this time to visit the waterfalls that are marked on the map. Although of modest proportions these still proved to be better than expected and the lovely scene was made all the more charming by the trio of grey wagtails chasing each other over the top of the falls. While the main path continued south I crossed over to make yet another detour – this time so I could visit the top of Birkett Common. A steep climb brought me up to Birkett Knott before a walk along the top of the common to the summit. Due to the murk the view was severely restricted though I imagine on a good day it would be a good spot for looking at the surrounding Mallerstang fells. From the top of Birkett Common I walked down to Tommy Road which I followed all the way down to Castle Bridge and then up to the main road where a gate provided access to Pendragon Castle. Despite the name which links it to the legendary Uther Pendragon, father of King Arthur, the castle was built in the 12th century by Ranulph de Meschines, during the reign of King William Rufus. One of its more famous owners was Sir Hugh de Morville, one of the four knights who murdered Thomas Beckett in 1170. After having a look around the ruins, and appreciating the view south along the River Eden, I next took the bridleway climbing up alongside Castlethwaite Gill. Along the way I stopped to take a photo of the small waterfall alongside the house at Brookside. It is worth noting that a much easier return to Nateby via Castlethwaite and Southwaite could be taken here. Rather bizarrely the course of the bridleway comes to an abrupt end at Red Scar Gill. I’m not sure where the red comes from because the steep sides of the gill were a peaty black. Of more interest were two waterfalls, the lower one in particular being worth the steep drop down into the gill. The next mile and a half was a series of ups and downs as I crossed Foss Gill, Owl Gill, Southwaite Gill and what felt like a host of other dry gills. In Foss Gill a somewhat dodgy detour, including clambering over a wall and a steep slide down a bank, brought me to what was the highest waterfall of the day. It was definitely worth the effort though it is not a detour I would heartily recommend. By the time I got to Southwaite Gill I was beginning to tire so didn’t drop too far into the gill looking for the waterfalls marked on the map. Instead I continued contouring above the intake walls to reach the limestone rim of Long Crag and on to Great Bell. After the heavy going of the previous mile and a half I finally found a nice grassy path which led me down off the fellside and then along Thringill Beck to the road. Turning right it was then an easy few minutes back to the car.